Fig. 1. Panel by Jonathan Cooke, Inspired by Burne-Jones. 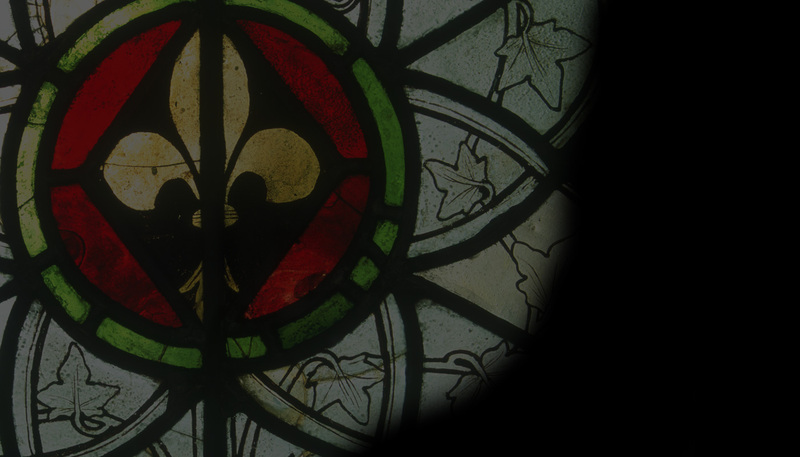 Supported by The Rottingdean Preservation Society and The Worshipful Company of Glaziers, Inspired by Burne-Jones celebrates Rottingdean’s connection with the artist and designer, and highlights Burne-Jones’s work as a continuing source of inspiration. The exhibition will see the Grange Gallery transformed, with panels of stained glass suspended in the tall Georgian windows and an array of light-boxes illuminating further glass paintings. More than 20 specialist glass practitioners have contributed to the exhibition, from studios across the UK (and one in US), and including some of the best known names in stained glass in Britain today. Several members of The Worshipful Company of Glaziers and the British Society of Master Glass painters (including Caroline Swash, Pippa Stacey, Jonathan Cooke, Lynette Wrigley, Pippa Martin, Emma Blount, Frans Wesselman and Nicola Kantorowicz) are keen to pay homage to Burne-Jones’ work and legacy. The exhibited pieces reveal in-depth exploration of Burne-Jones’ works, drawing inspiration from his paintings, stained glass and tapestry, the artists’ sources including The Briar Rose and Perseus cycles, The Beguiling of Merlin, The Golden Stairs and The Adoration of the Magi tapestry. Fig. 2. Detail of panel by Pippa Martin, Inspired by Burne-Jones. Fig. 3. Detail of Wings by Pippa Stacey, Inspired by Burne-Jones. The theme has inspired a fascinating and diverse collection of highly-individual responses: narrative pieces and abstracts, a dynamic spiral of tiny details from stained glass windows, exquisite studies of jewel-like flora, serene angels, portraits and evocations of the Rottingdean Burne-Jones knew. One panel has at its heart an actual piece of Burne-Jones’ stained glass. Tuesdays – Saturdays 10.30am – 4.00pm , Sundays 2.00pm – 4.00pm, Closed Mondays.